Wright and Prescott each attended Mississippi State and the Seahawks linebacker said he always knew Prescott would be a good NFL QB. During the 2015 season, K.J. Wright made a prediction to a couple of reporters during a casual moment in the Seahawks locker room. Sure, maybe he was biased because Dak Prescott was then the quarterback at Wright’s alma mater — Mississippi State — but mark my words, Wright told reporters, Prescott is going to be an NFL star some day. “I’m going to be a GM (general manager) when I retire,’’ Wright said. But if, for years, Wright has been one of Prescott’s biggest cheerleaders from afar, this week he’s hoping to be one of his biggest nemeses on the field when Seattle plays at Dallas in a wild-card playoff game. Wright, who played at Mississippi State from 2007-10, got to know Prescott a little bit during visits back to Starkville for the occasional game and in the offseason. But if he thought in 2015 that Prescott might be a good NFL quarterback one day, Wright said he’s even more impressed three years later with how Prescott’s game has evolved. 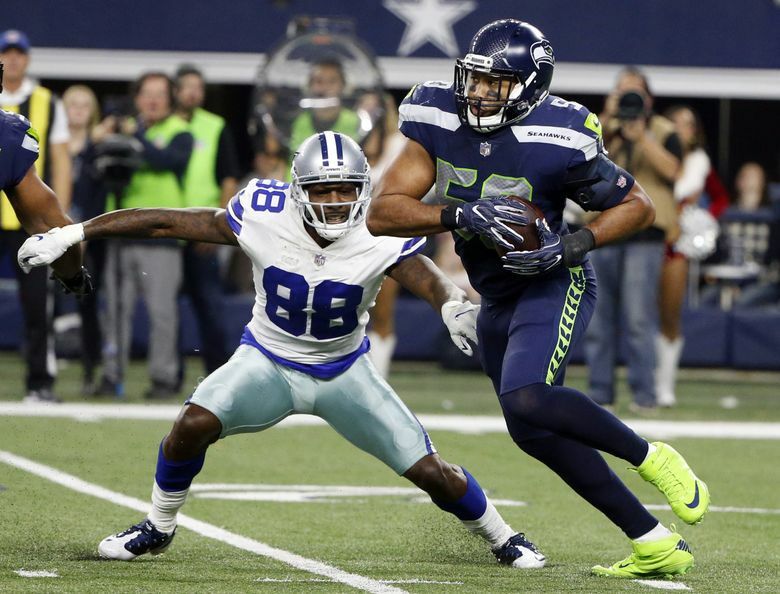 But in a trend the Seahawks hope continues, Prescott has not played well against Seattle in two games — both were eventual Seahawks victories in which Dallas has scored just one touchdown in 23 possessions. Prescott has thrown four interceptions and just one touchdown pass against Seattle, and in three seasons as a starter, two of his four lowest passer-rating games have come against the Seahawks — 51.2 when he threw a pick-six in a 21-12 Seattle victory in Dallas last December, and 54.5 when he threw two more interceptions in Dallas’ 24-13 defeat at CenturyLink Field in September. Wright didn’t play in the September game, when he was still recovering from knee surgery. But he did play last December when he got one of the two interceptions off Prescott — which is one of only two in Wright’s career — which set up a Seattle touchdown that clinched the game. Wright said the key to shutting down Prescott in both games was that the Seattle defensive line got pressure — he was sacked nine times in the two games, five in September. “We know it always starts up front,’’ Wright said. And while Wright is a fan and friend of Prescott’s, he said the other key for Seattle in this game is containing Dallas’ run and star tailback Ezekiel Elliott, who led the NFL this year with 1,434 yards — in essence, forcing Prescott to beat them through the air. Interestingly, the Seahawks haven’t really stopped Elliott the past two years — he had 97 yards on 24 carries in the 2017 game in Dallas, and 127 on 16 carries in September, the most the Seahawks allowed to any rusher this season. But Prescott barely has thrown for more yards against Seattle in those two games than Elliott has rushed for — 349. The Seahawks, though, will catch Prescott as he comes off two of the best games of his career. Prescott threw for a career-high 455 yards in a victory over the Eagles on Dec. 9. Then, he had the second-highest total of his career with 387 yards (as well as a career-high four touchdowns) in the regular-season finale last Sunday — a comeback 36-35 victory over the Giants, and a game in which Elliott didn’t play. Prescott has thrown for 12 touchdowns with just three interceptions in the second half of the season as Dallas went 7-1 to win the NFC East, a run that began after Dallas acquired receiver Amari Cooper from the Raiders. That Wright expects to get Prescott at his best Saturday in Dallas means it’s a good thing Wright plans to also be at his best. He has played in just five games for Seattle this year after suffering a knee injury in the preseason and then a setback after he returned at midseason. But he played 47 of 66 snaps against Arizona on Sunday, on one play quickly tracking down David Johnson on a pass. Coaches and teammates have pointed to that play as proof that Wright is back to his old self. Saturday, he said he’ll play every snap if the coaches let him.